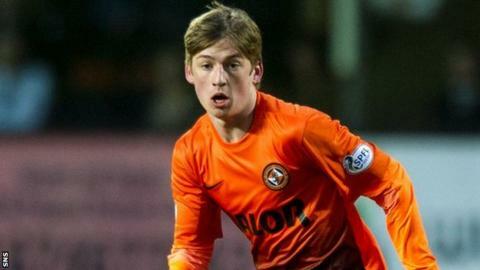 Dundee United midfielder Ryan Gauld will become one of the greats of British football, according to manager Jackie McNamara. with the Scottish Premiership club until May 2017 on Monday as he turned 18. But McNamara does not expect Gauld to see out the whole of that deal. "He's going to be a massive star in our national team, there's no doubt about that," he told BBC Scotland. "He will be one of the greats of our game." Gauld has been dubbed the "Mini-Messi" by his team-mates after becoming a regular fixture of the United first team this season and generating comparisons with the Argentina and Barcelona star. The 5ft 6in Scot has been scouted by top clubs from around Europe, including England, Italy and Spain, and McNamara agrees with United full-back Mark Wilson who said this month that Gauld surpasses any of the young players he saw coming through the ranks while at Celtic. "I have been fortunate in my career to be working with some really good young players, like Aiden McGeady and Shaun Maloney," said former Dunfermline Athletic, Celtic, Wolves, Aberdeen, Falkirk, Partick Thistle and Scotland defender McNamara. "But, for me, Ryan, you look at him and he's still like a wee boy, his size there, but he flies into tackles, he goes for headers, and he's only going to get stronger and quicker. "Everybody can see the talent the boy has. For me, he's one of these boys who will always strive to be better. "His vision, his ability is just fantastic. Upstairs, his football brain is way beyond his years, way beyond anything I've seen." Gauld scored his sixth goal of the season in a hours after his profile rose further through a profile on BBC One's Football Focus. "We had the pre-match meal on Saturday before we went down to Kilmarnock and the Football Focus thing came on and I was a wee bit worried about it, but before it came on, he went out the room," said McNamara. "He doesn't like it. He never gets carried away - he takes all the plaudits but it doesn't affect him in any way." McNamara also recently managed to persuade despite a failed bid from Sunderland. "It's the same with John Souttar," said the manager. "They are all the same - Gary Mackay-Steven and Stuart Armstrong - they are very level-headed and, for me, it's so refreshing. "To be honest, I think everything comes from the parents. Obviously, Ryan's agent will go through everything with him and we've had a few meetings with his parents and his agent and they understand the best place for him just now is with us, to play and to learn and get better and get stronger. "When he goes to the next level, we'll all be delighted and, if Ryan's here by the time he's 20 or 21, we'll be very surprised because he's that good. "He's like the rest of them. They will go, they will leave our club and go to a lot higher and bigger things in other countries."